There are a lot of recipes out there for cornbread. Most of them are not even truly cornbread, but rather a cake flavored with a bit of cornmeal. I'm going to share with you my own recipe for real cornbread. It is a simple recipe, but it makes, to my taste, much better cornbread than most I have tried. The best foods were developed by poor folks, making due with what they have available to them. Mexican food, Italian food, Chinese food, Southern barbecue were all developed by salt of the earth types of people, using a few cheap ingredients to create as flavorful a dish as they could manage. Meat, if included, is usually from animals that are either cheap and easy to raise on a small homestead (like pigs and chickens) or wild creatures that are plentiful and easy to trap (like shrimp, crayfish AKA crawfish or crawdads, blue crabs, even sparrows in Mexico). I refer to this kind of food as "peasant food". Most of my favorite foods are peasant foods. And of those, pinto beans and cornbread are one of the absolute best dishes, as well as cheapest. As an aside, I have noticed that many young people think ramen noodles are a cheap way to eat. They are not. For one thing, you simply cannot subsist on a meal of ramen noodles for very long. It is just not very nutritious. For another, although ramen noodles look cheap when you are looking at a package that costs only ten cents and supposedly serves two, it is really not that cheap. A meal of cornbread and pinto beans is much more nutritious and filling, and can be much cheaper than ramen noodles, depending on the ingredients you use and how you obtain those ingredients. If you have a small homestead and can raise your own beans and corn, and perhaps a couple of hens for eggs, it can be free if you forgo the milk. Or, even if you buy everything and don't scrimp too much, you can buy milk, eggs and dried beans at the grocery store, and either corn meal at the grocery or a 50 pound bag of dry corn at the feed store (currently about $7.50 where I live) and grind it into meal on a $25 Corona mill. Even if you buy cornmeal at the grocery, you spend less overall on your food bill. This is because, as mentioned before, you can't live on ramen noodles alone, not for long. But you can literally live on beans and cornbread, or even beans and corn mush, which is just cornmeal and water, cooked in a skillet. Preheat the oven to 450 degrees Fahrenheit. Heat the fat to smoking in a 10" cast iron skillet on the stovetop, while mixing the rest of the ingredients in a large bowl. When the oil just starts smoking, swirl it around to coat the sides of the skillet, then pour it into the batter and mix it in well. Set the skillet back on the stove, turn off the stovetop, and pour the batter into the skillet. Pouring it into the hot skillet will create a nice crust. Put it in the oven and bake 20 to 25 minutes or until golden brown. Cut into wedges or slices, add real butter, and enjoy. Actually, this cornbread is so good, you can leave out the butter if you prefer. It is amazingly sweet, even though it is not sweetened. You make some excellent points here. I have always used those "other" recipe's for making cornbread. I can't wait to try this. 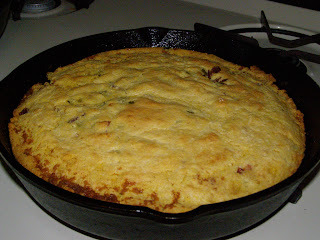 Heaven knows I love a good pan of cornbread! One cup whole corn meal has 8.11 grams protein. Your cornbread recipe has a total of 16.22 grams protein. One cup dried pinto beans has 28 grams protein. Make your cornbread with one cup corn meal and one cup pinto bean meal for 36 grams protein. I never bake cornbread. I make corn and bean pancakes for a quick satisfying meal. If you will dig the Dakota fire pit I'll grind the corn and beans. We can have pancakes in just a few minutes. I love "real" cornbread. Once you add sugar, it's a corn muffin, or corn cake as you say - a dessert. I've never heard of pinto bean meal, but vlad's dish is sounding pretty interesting too. I tested your recipe. The results are moist and flavorful. It tasted good out of the oven and kept in the skillet overnight and tasted good the next day...even better when heated through. I'll give it a few more days to age and test it with other toppings besides honey and butter.